Wait a minute, is this actual emotional development for Simon Baz? Parallels to our current plight along with visually interesting constructs? Warning they’re will be spoilers going forward. So be sure to read your comics before reading this review. You have been warned. If you’ve been reading my reviews since Rebirth, then you know that I believe Simon has been short changed. Yes they’re were sprinkles of his development outside of his partnership with Jessica, but this issues puts Simon as the lead. The opening sequence with Simon playing strip poker is a great way to humanize this character that some might perceive as one dimensional, and even though the romance angle was expected from my end the twist ending could providing for some dramatic heartbreak going forward. 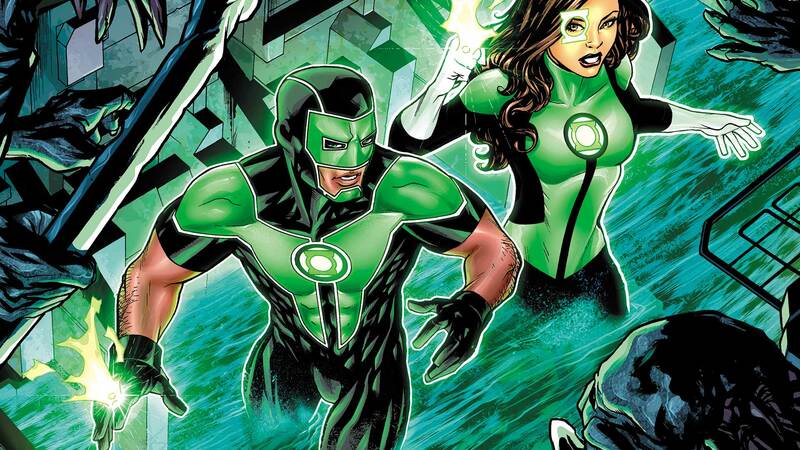 I have nor will I never be against seeing more of Jessica Cruz develop more as a Green Lantern, but I’m still glad the spotlight is slightly shifting towards Simon. Are you a person who wants analogies from the real world when they read their comics.For those that don’t want any reference to our current imploding world, I completely understand your viewpoint. You pick up these comics to escape that dread, but the best science fiction in my book reflects the current status quo and it allows us to see how we as humans can avoid a deeper whole. Even though I don’t share the ideology of the mob in this issue it does resonate with me because the parallels to a certain mind set. For those that might disagree with the idea of a Green Lantern comic dealing with these subjects don’t know about Green Lantern/Green Arrow. The issue as a one piece was entertaining, and Seeley even found a way to make simple pages of dialog are made interesting because it isn’t just three characters exchanging information. Having Carlo Barberi draw a sparring session with Jessica and Simon to look like characters ripped out of Arabian Knights, Speaking of Barberi, I thought this issue for the most part still retained consistent but in certain panels facial expressions were muddy than they should have been, given the perspective. of said panel. Overall this issue of Green Lanterns was deeply engaging with solid art, and while I hope that Simon’s love life can actually blossom.